Operators - Roska DBO Inc. The stakes are high. Cash flows, reputations and people’s safety all depend on having the right people in critical operating positions. To repair your equipment when it fails. To maintain it on a regular basis. And to operate it 24 hours per day. Whether it’s for a single shift, a short-term posting or a longer-term contract, Roska has the operators you need. One person, half-a-dozen or an entire plant complement. We understand how the oil and gas producing sector operates. This insight has helped us build up Western Canada’s top talent pool of qualified, motivated oilfield operators, with a particular focus on northwest Alberta and northeast B.C. We appreciate the many challenges our customers – field supervisors, facility managers, lead hands, foremen, regional operations managers, team leaders or consultants – grapple with on the personnel side. Our staffing service operates with two critical objectives: maintaining a base of qualified oilfield workers with diverse skills matching those of a producing company or midstream operator, and making sure they’re available for immediate deployment. These oilfield workers have learned that, when they need a job, they just call Roska. 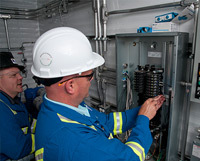 That has made us the industry’s leader at fulfilling the energy sector’s staffing needs. We make things simple and convenient for you, handling payroll, benefits and all administration, and providing tools and trucks where needed.